Being both a stickler for comfort and a shoeaholic presents quite a conundrum: It clearly hasn't stopped me from buying a shipping container's worth of footwear, but it does mean that a certain percentage of said purchases are redundant because they're actually too crippling to wear. They are pretty, though. Now that I'm a "grown-up" who is trying to dodge such foolish decisions on the regular, my interest was piqued when I discovered an ingenious German shoe brand (bear with me) creating stilettos that can turn into mid-height heels and then down to flats. And—most importantly—unlike many bizarre startup shoe brands, these styles are genuinely nice. I promptly called a pair in from Mime et Moi's HQ to put them to the test. Sensible and essentially three pairs of new shoes in one swoop? Sounds ideal. While I don't like to swap heels for flats in public (pavement + bare feet + onlookers = ew), I was hoping this handy switcheroo system could be a more ladylike option should push come to shove. And with a series of weddings coming up this summer, this could finally prevent me from having to bring an emergency pair of flats when the dance floor gets the best of me. Keep reading for our review of Mime et Moi's interchangeable shoes. My Mimes—the Downtown style—arrived as flats, along with separate mini boxes and handy pouches for the stiletto and midi heels. This style costs £162, and the standard package is as follows: one pair of shoes, with one pair of flat heels and one pair of heels. I also ordered the lower 7-centimeter block heels as an extra for £30. Not bad, considering another entire pair of shoes would most likely be more than that. The packaging is simple and neat, the shoes look very well-made, and let's be honest, I'm a sucker for anything velvet right now. So after passing them around the Who What Wear HQ for inspection (everyone wants a piece of this action), I was intrigued to see just how these work. So, fortunately, the shoes come with some instructions—you'll only need to look at them once, but intuition alone may not be enough to set you off on your shoe adventure quickly. The functionality centres around a small lever in the flexible sole of the shoe (it's a patented invention called the Flexheel insole). Lift this latch to release the heel, slip the interchangeable appendage on, close and then step into the heel with your body weight, thus securing the swap. I was waiting for some almighty click to signal that all was okay, but it's a quick, silent affair. Simple. It feels unnatural that shoes can actually do this without being genuinely uncomfortable or feeling imbalanced, but so far, so good. I'll be honest with you, I'm not one for flats. But because these have a little lift, I found them to be more comfortable and elegant than most. 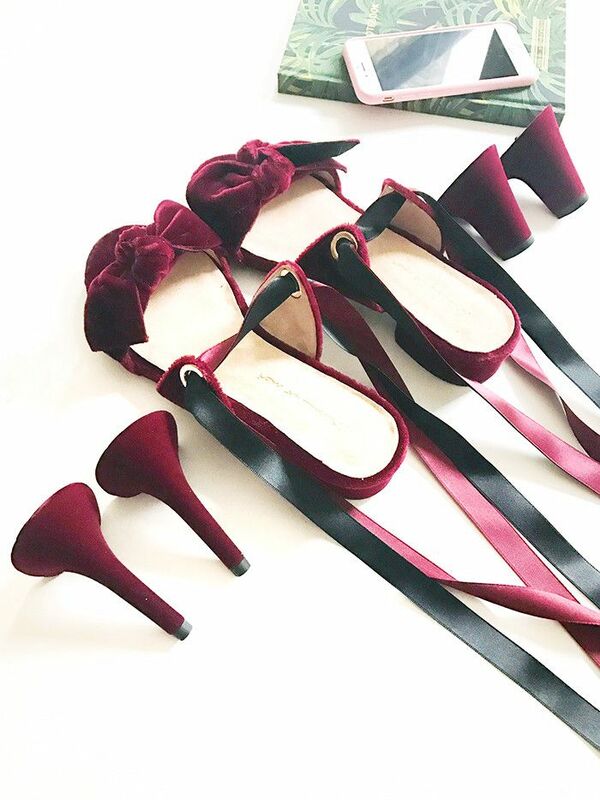 I'd love a style like this with an attached ankle strap rather than the ribbons, but that's just me thinking of the shoe's longevity and future. The mid-heels are by far my favourite. Super easy to walk in, extra comfy and a perfect day-to-day shoe when wearing jeans and a simple sweater. I had a feeling they were manufactured to exacting standards, and it turns out they're produced in Spain—a country famous for quality shoemaking. A great idea for going from work to a party or event, the additional stiletto heels would be an ideal thing to keep in my desk for last-minute changes. I'm so convinced that I may even buy a gold pair of sandals for my wedding day. If you're intrigued, check out Mime et Moi's website to see all of the styles you can shop now.